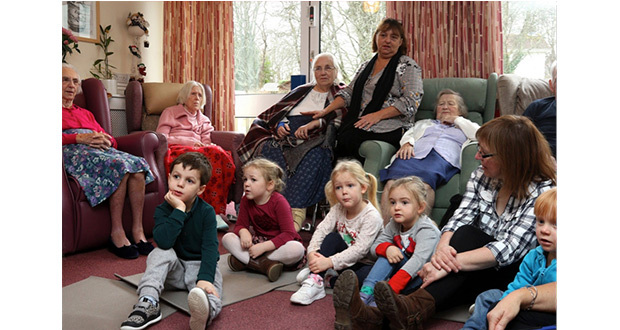 Young and old are being brought together by music and song as part of an exciting new programme involving residents from Cornwall Care’s Mountford care home and children from Truro Nursery School. Called Chorus Connections, the project involves a group of four-year-old children from Truro Nursery School visiting Mountford to sing and play instruments with the residents every Tuesday morning. The sessions have been organised in partnership with Little Bird Music, an independent musical education provider, and Arts Well, a community interest company that champions the role of the arts and creativity in promoting health and wellbeing. Mountford is a 36-bed nursing home for people with long term conditions such as diabetes, Parkinson’s, dementia and those requiring palliative care. Mountford manager Alison Rowe said: “Chorus Connections is brilliant. Our clients love it, our staff love it and our visitors love it. Everyone looks forward to the sessions every week. Chorus Connections is a pilot programme, and it is hoped that similar sessions can be arranged at other venues. Alice Browning from Little Bird Music said: “I’m delighted to be leading such an exciting project in Cornwall. Chorus Connections aims to give all the opportunity to contribute, make meaningful connections and benefit from the joy of learning and making music together. Helen Adams, Headteacher at Truro Nursery School, said: “There’s a lot of research to support the benefits of intergenerational experiences and so far the outcomes are really positive. “The nursery children are really engaged when they are there. They are naturally gentle and caring in their approach with the residents and enjoy sharing the music experiences. There is evident joy among the residents who are keen to take part and show increased engagement levels. And a number of parents and carers have told us how much the children are talking about their trips to Mountford House.